1.4- 16V Quiksilver/ CLIMATE CONTROL/ NW BANDEN/ NW REMMEN/ APK 21- 11- 2019 !! 1.6- 16V T Sport /CLIMATE CONTROL/ **AUTOMAAT**/ 17 INCH LM VELGEN/ LEDER int.mog. 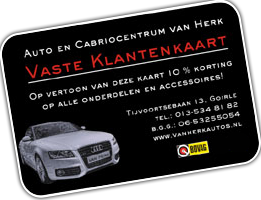 1.6 VTi /CLIMATE CONTROL/ PDC achter/ LM VELGEN/ FACE LIFT model/ WINDSCHOT ! 170C 1.9 D Avantage APK 28- 01- 2004 MARGE AUTO !! 1.2 Authentique Basis CENTRALE VERGR./ STUURBEKR./ ELECTR.RAMEN/ RADIO C.D.